Are you an artist or creative professional looking to learn more about selling your work amidst diverse, changing markets? 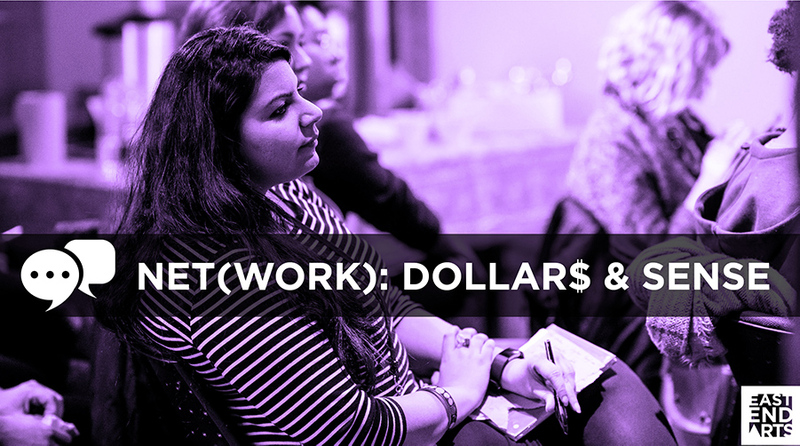 Net(work) 2019 looks at the theme ‘Dollars & Sense’: join East End Arts for a free evening of dialogue and learning on making a living making art! The evening will feature a panel discussion followed by a networking hour, all inside the beautiful Connections Gallery in east Toronto! Hosted and facilitated by Dawn Laing, of Notion, and featuring a panel of three talented local artists – Caerina Abrenica, Alex Grant, and Kyra Kendall – who will talk about the ways they’ve diversified their revenue streams, how they’re using social media to promote their work and the different avenues for making a living making art! After the panel discussion the floor will be open for participants to put their networking skills to work! Interested in attending? Register below! This information will help East End Arts learn more about where our participants are coming from. This information will be used to help shape the panel discussion, and ensure participants’ needs are being addressed. East End Arts strives to provide artistic experiences and programming that reflects all the communities that we serve. As a non-profit arts organization, East End Arts aims to ensure that there is equal access to the arts among all communities, regardless of gender, age ethnicity, race, ability, sexual orientation, and socioeconomic status. By collecting this data, East End Arts will work to address any existing gaps in accessing arts programming, along with addressing the unique needs of specific communities.